The workshop was well attended by over 60 participants from various government departments, research institutions, businesses and NGOs. The DAFF small-scale fisheries unit updated the participants on the implementation process thus far and the envisioned way forward. Results from the baseline socio-economic analysis of small-scale fishing communities in each of the four coastal provinces were also presented. It provided a glimpse into the challenges and poor socio-economic conditions faced by many fisher communities in South Africa and highlighted the need to sustainably develop and support the sector for the betterment of vulnerable fisher communities. 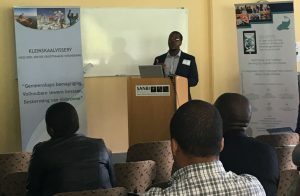 Dr Serge Raemaekers (UCT) presented the Abalobi app, regarded as the cornerstone of small-scale fisheries management. The mobile app has been developed in consultation with fishers in order to assist them in capturing data, monitor weather conditions and easily access the market structure (amongst a range of uses). Essentially, the app develops local knowledge and ownership, and aims to bridge the gap between scientific and local knowledge. 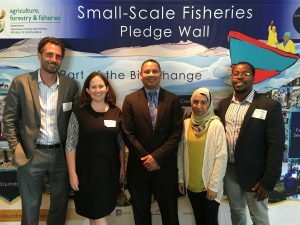 The participants were given the opportunity to outline how they envision supporting the small-scale fishing communities. The pledges and suggestions of involvement were encouragingly forthcoming by a number of government departments, NGOs and businesses. The organisations pledged support in various forms, from training in safety at sea, capacity development of co-operatives, skills development in fishing communities, sharing knowledge and expertise of business acumen, aligning research and assisting in empowerment of fishers in the market structure. The Partnership Pledge Wall was then unveiled. 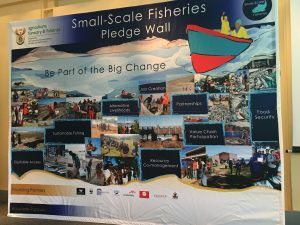 The pledge wall serves as an encouraging reminder of the importance of forging partnerships and cross-sectoral collaboration in support of the successful implementation of the Policy for the Small-scale Fisheries Sector. It was an encouraging end to an engaging workshop. The IOI-SA is committed to being a neutral, transparent facilitator and welcomes the opportunity to be involved in meaningful engagements. The full workshop report will be available for download once it has been finalised.